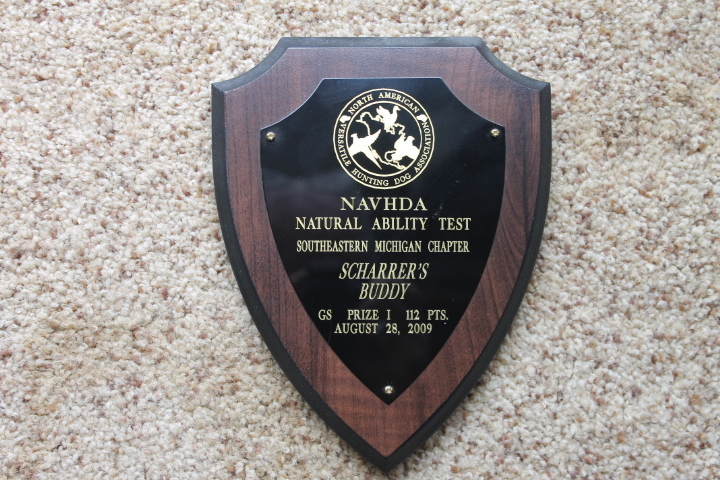 ​BUDDY is a dog that I am very proud and happy to own. He is line bred off of DC HILLHAVEN'S HUSTLER. He is a son of FIELDMASTER'S SILVERDOLLAR MH, and Grandson and DC AFC 3 x NSTRA CH GAMBLE'S ODYESSY FRITZ MH UT 2. Buddy was a fast starter and I was shooting birds over him when he was 6 months old. He is very smart and a fast learner and was completely force broke to retrieve at 9 months of age. He also has a very friendly and loving personality that makes him a great pet as well. What I like about this bloodline is their great natural ability and conformation. He has a very snappy point with his head and tail held high. He also has the gait of a show dog while working the field. Buddy was whelped on 8/21/08. He has sired 10 litter's, averaging 10 pups per litter. All of the litters have turned out great, showing many of the same traits that's made Buddy such a fantastic gun dog. He is certified OFA GOOD and has his DNA on file with the AKC. STUD FEE is your CHOICE of two methods of payment. Either $1000 or my pick of the litter. You are welcome to come by our kennel and see Buddy for your self. Reference's on request. FIELDMASTER'S SILVERDOLLAR MH x SCHARRER'S COCO NAVHDA PRIZE 2 107 PTS. SCHARRER'S BUDDY - 3rd place in BDC Fun Hunt at Flying M Ranch.